Over the last decade there has always been an air of familiarity when Otis Gibbs hits town. The old stories never lose their charm and frequently Otis updates his song base with a new record of unrelenting quality. With my occasions of seeing Otis live now possibly running into double figures there was a double pronged freshness to his return to Birmingham and a renewal date at the Kitchen Garden Café. On one hand the evening was blessed with a bunch of new songs as an Otis Gibbs ‘below the radar’ album has emerged over the summer months. To a greater extent, the opening set did not feature a single old time story, a definite first from a hazy but reliable memory of so many Otis shows. However any sense of re-assurance lacking was firmly rectified after the break with the return of ‘tractor day’, ‘interesting uncles’ and ‘work comradeship’. Essentially these provide the backdrop to two Otis Gibbs classics and the twin tracks of ‘Small Town Saturday Night’ and ‘Something More’ should always remain staples of his show. While other old songs such as ‘Kansas City’, ‘Caroline’ and ‘Town That Killed Kennedy’ retain a timeless appeal, the key to the success of this show was the unveiling of a number of tracks from the album Otis recorded in his home over the summer. MOUNT RENRAW was introduced as an indulgent milestone birthday present and has provided the ideal outlet to house yet another supreme bunch of songs. Five of these had their Birmingham premiere this evening with ‘Great American Roadside’ and ‘Sputnik Monroe’ leaving the most distinct mark on first listens. The first of these goes a long way into defining the curiosity surrounding Otis’s song writing purpose as he revealed the sheer inspiration derived from surveying the vastness and quirkiness of his home land. The second formed the basis of the evening’s most interesting story following his account of a wrestler in Memphis Tennessee being at the centre of a chain of circumstances leading to a seismic moment in the advance of de-segregated entertainment in America’s South. ‘Empire Hole’, a song based on the cultural and economic impact of Indiana’s limestone quarrying industry, ‘Ed’s Blues (Survival)’ and ‘Bison’ were the other new songs revealed. The latter took its inspiration from the occupants of his East Nashville home a long time before modern life entrenched its practices and values. The surname of a key person in the backdrop story to the song – Warner – was intriguingly reflected in the album’s title. MOUNT RENRAW has not had a conventional release yet and it remains to be seen whether this happens. 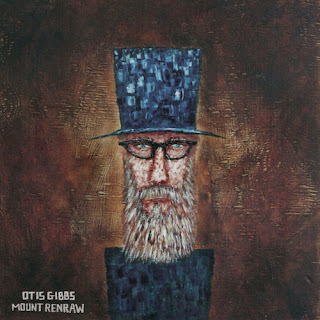 Copies have been available at the shows and it is important in the widening of the appeal of Otis Gibbs that as many folks as possible get to listen to this and any other record that has emerged under his name over the last fifteen years. This guy is a song writing legend and a body of legacy-laden work is already intact for future generations to discover. Otis Gibbs will always be a touring treasure and a creative person powered by an independent spirit devoid of trend setting gimmicks. Grateful, humble and sincere are other attributes that spring to mind. His songs combined with a serious desire to preserve and further signify the unfiltered relationship between artisan and partisan make him stand out in a crowded environment. Long may the Kitchen Garden Café and many other venues around Britain continue to host a welcome visitor from Wanamaker Indiana, via East Nashville Tennessee.